Artist Blacksmith, Brian Russell established his business over thirty years ago at the 200 year old forge in Little Newsham, set in the heart of Durham countryside. 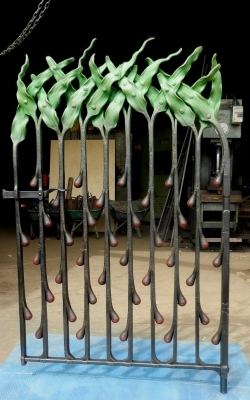 The work carried out at Little Newsham Forge ranges from bespoke gates, railings and sculptures to various other uniquely designed pieces of artwork. The workshop has grown in size and now contains powerful forging machinery as well as the traditional anvils and coke hearths enabling large and complex architectural projects to be undertaken. Each piece is individually designed by Brian Russell and all of the components are made in the forge. The finished article is assembled using traditional blacksmiths’ jointing techniques. Brian is aided by an enthusiastic team of trained artist blacksmiths. By using hot forging techniques that have been around for centuries, Brian and his team are able to create exciting new forms. For full details of all Brian’s work please visit our Work Portfolio and Designs Gallery.